In the last week of February senior Kymco Management from Taiwan headquarters travelled around Australia to learn more about the Australian climate and terrain. Kymco Taiwan Project Leader for Research and Development, Bruce Lan and Kymco Taiwan Warranty Manager, Mikie Wu visited several Kymco Dealerships to explore future developments of the Kymco range, including motorcycles, scooters and ATVs. KYMCO Taiwan and Kymco Australia are devoted to working together to ensure that the Kymco product range is second to none in the Australian market place. “Kymco Australia is thrilled to welcome the Taiwanese Research and Development Team to Australia,” says Kymco Australia National Sales and Marketing Manager, Alan Collins. Kymco Australia and Taiwan work under the philosophy for agricultural ATVs of ‘Simplicity in Design with the correct features.’ This means easier maintenance and lower costs and this is why many Australian farmers are turning to Kymco to get the job done. Kymco Australia has a vast range of scooters and motorcycles also in the Market, with a model to suit everyone. Stylish designs and advanced technology has helped to make these reliable bikes a popular fixture in Australian community. Whether it is zipping to the shops or highway travel, Kymco has the answer. And with Kymco Taiwanese management team taking notes on the Australian climate and terrain we are sure to expect a continuation of the Kymco success for years to come. 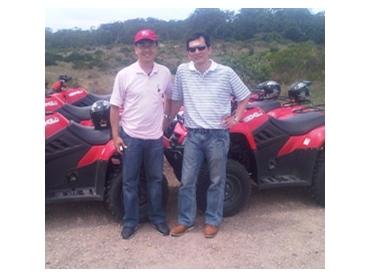 “The Taiwanese visit to Australia means exciting things for Kymco Australia in 2011 and beyond,” says Kymco Australia National Sales and Marketing Manager, Alan Collins.